1. You run. Okay, this might be obvious (okay, it’s REALLY obvious). But it’s still an important distinction. Before, going for walks was a fulfilling experience. Now, you can’t help but speed it up a little (even if you’re not wearing the right shoes). Walking just feels so… inefficient. You got a taste for speed and the burn that accompanies it and now you’re utterly hooked. Plus, there’s no denying it: Saying “I’m a runner” is the linguistic equivalent of puffing out your chest and strutting. 2. You’re loyal. To shoes, that is. When it comes to tops and shorts, you usually just rummage through your closet for something comfortable but still relatively good-looking (hello college t-shirt – Go Bears!). When it comes to your shoes, though, you find yourself developing a fierce loyalty to a specific brand, right down to the style (“Oh, I only wear Brooks. The Cascadia 9.5. What do YOU wear?” rocks back and forth on feet that, lo and behold, are sporting a well-worn pair of Cascadia 9.5s). 3. You know the trends. Don’t you know minimalist is out? It’s all about maximalist shoes these days. Even if you don’t abide by these highly volatile trends, you can’t help but leaf through the latest Runner’s World or Outside Magazine’s Gear Guide to stay up to date on what the coolest new shoes are (it’s always about the shoes). 4. You love food. Food is now your BFF. You love food so much you can’t stop thinking about it. And it tastes sooo much better after a quick romp (leftover Chinese food from two nights ago that’s devolved into some inscrutable mass of god-knows-what? GET IN MY MOUTH). 5. Solitude = Sanctuary. You might be the most gregarious, outgoing, bubbly mass of extroverted effervescence with 500+ friends on Facebook and dinner dates every other night, but when you run, you often run alone. And what you’ve learned through running alone, is that your “me time” is actually pretty darn awesome. In fact, when it’s just you and the open road, it’s just downright effin’ peaceful. 6. You think in miles, not minutes. 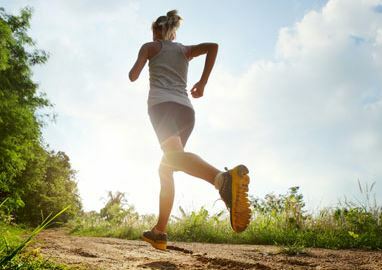 Sure, every running guide out there talks about doing such-and-such miles in so many minutes, and there’s a general twitter over how to increase you pace, your cadence, monitor your heart rate, and on and on. When you’re a runner, you might look into these things. But most likely, you’re simply logging miles. Saying something like “I did 5 miles today” is something you will always say, beaming with a beer or some other reward for tacking on another mile to your running repertoire. 7. You abide by runner’s code. It’s kind of an unspoken rule–something you’ve never read about, a habit you’ve picked up on as time goes along. It’s doing one of three things: 1) The nod, 2) The wave, or 3) the breathy “hey.” Basically, it’s acknowledging your fellow runners without doing the whole pat-each-other-on-the-back runner’s club schtick. And no, never making eye contact because you’re too tired is simply breaking the code of conduct (it’s rules for dismissal). 9. You’re routine. You have at least two regular routes: one short and one long. You’ve gone on Google Maps and used the little distance tracer tool to figure out how many miles you logged (or if you’re slightly less lazy, you actually go to mapmyroute.com or use Strava), and since then, you’ve run those routes so many times, you could run them blindfolded (please don’t). 10. You’re an awesome person. This is the most important point. 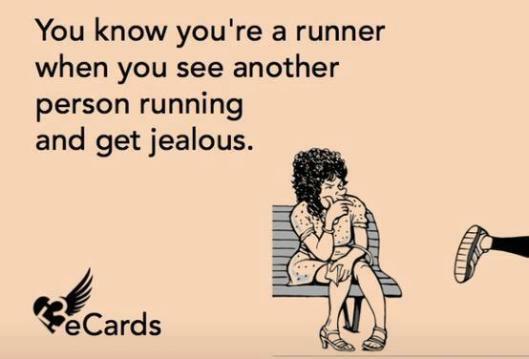 Runners are the coolest people, ever. Why? You’re a kid with absolutely no self-consciousness or self-awareness built into an adult body. Case in point: During every run, you’re likely to stop and do a random spree of squats, arm swings, walking lunges or leg kicks that look downright schizophrenic to onlookers. Do you care? You don’t even notice. Letting your arms flap as you run, drool slip out the side of your mouth, grimacing and other generally unflattering facial expressions, wiping your gross snot on your sleeve (repeatedly) – it’s all fair game. And you do it. A lot. You seriously don’t give a **** how you look while you run, so long as you’re comfortable. All you care about, really, is running–the one habit all of us have had since childhood (including the love for all things sugary and sweet). Bottom line: if you run, you rule. This list could go on (and really should). Add your own signs-you’re-a-runner thoughts below!